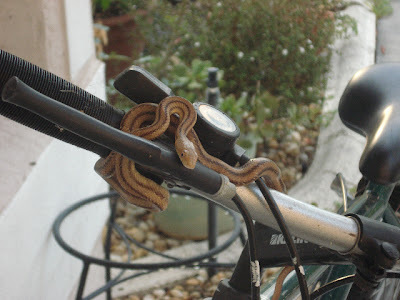 This is a Garter snake which was discovered by artist/animator Roland Mechael Ilagan on his bike at his home in Florida. Scientists speculate that as the natural habitats of wild animals decrease, we may find more of them visiting our homes and even intermingling with with us whether we're aware of it or not. This snake is sending us the message that we should try to understand. As we encroach more into the dwindling wilderness, the wildlife that live there have no choice but to encroach into ours in search of food and shelter. We should be the caretakers of the wilderness and live in harmony with it.